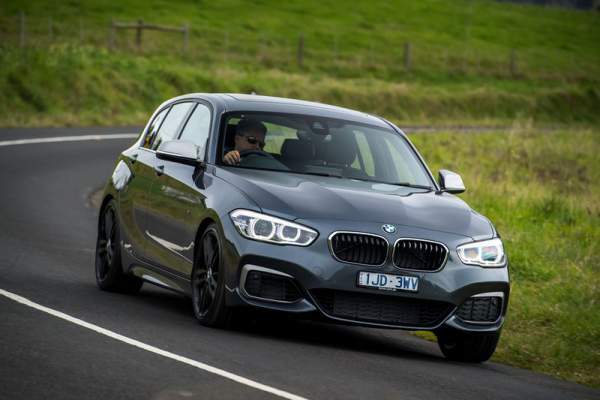 We will never see another car like BMW’s M140i. Sitting atop the brand’s compact 1-Series range, the M140i combines a practical hatchback body with a powerful six-cylinder engine that drives the rear wheels.There’s nothing else quite like it on sale today, and it is extremely unlikely we will see anything like this in the future. BMW is the only brand to build rear-wheel-drive hatchbacks, with rivals such as Audi, Mercedes-Benz and Lexus electing to go with cheaper front-wheel-drive layouts as the basis for budget models.Available with a range of three and four-cylinder petrol engines to attract new buyers to the brand, the updated 1-Series range features fresh alloy wheels, LED headlights, improved infotainment systems, minor interior tweaks and new colours inside and out. Priced from $59,990 plus on-road costs, the range-topping M140i is cheaper than ever for 2018 despite gaining additional equipment including an 8.8-inch touchscreen – the previous-generation arrangement had to be manipulated using BMW’s iDrive remote controller. Naturally, sat nav, a reversing camera, parking sensors and climate control are fitted as standard. Luxury touches include a 12-speaker Harmon Kardon stereo (though Apple CarPlay connectivity is a $479 option) in a cabin home to well-bolstered sports seats trimmed in a choice of four leather colours or cloth and Alcantara as a no-cost option.